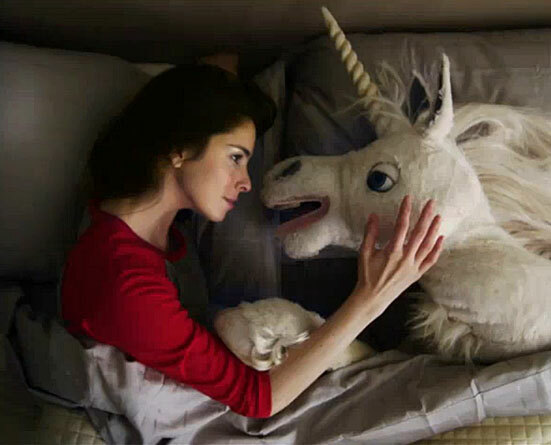 Either someone spiked my spinach curry with LSD today, or I’ve just seen a puppety unicorn serenading Sarah Silverman with a power ballad! Lucky I had the presence of mind to take a picture, to prove to myself (and you) that it actually happened. Apparently the video in question is part of a well-known chewing gum company’s sneaky viral marketing campaign… but that doesn’t stop it being straight-up hilarious all the same. In an effort to counteract the free advertising that I’m inadvertently giving their product, I’d just like to point out that all chewing gum is evil and should be eradicated from the Earth altogether. Especially the bits we actually have to walk on. This entry was posted in Rants about Ads and tagged Sarah Silverman. Bookmark the permalink. Yeah, but I worry she puts herself down too much sometimes. In a recent interview with the AV Club she actually tried to convince the interviewer that she was no longer a hottie. That’s just crazy talk. This is true. It’s funny if she defangs an insult by adopting it as a joke, but not if she believes it, or expects us to!